The Sabra was born when Autocars, an Israeli firm, commissioned Reliant, a British car company to build them a sports car. 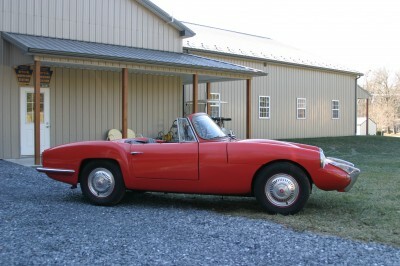 The Sabra Sport was to be sold as a new entry in the growing US sports car market in the early 1960’s. Total production is estimated at 208, with 55 sold in the UK under the name of Sabra, and 153 were exported to the US under the name of Sabra. The Sabra Sport was introduced at the 1961 New York Auto Show. This Sabra has been sitting in a warehouse for many years before finding its way to our shop. This is certainly a rare find and has the potential to be a nice driver.